In a disproportionate amount of fiction works, the protagonist turns out to be a writer. The explanation is that the end products are created by writers, who put themselves into their works. And when you write what you know, a writer tends to write about writing. In other words, it’s selection bias. According to tvtropes, this phenomenon is called “most writers are writers,” and writing about writers has several advantages in providing realistic excuses for (un-)realistic diction, investigative skills, journalistic connections, short work weeks, and arbitrary research knowledge that you characters need to have. The same applies for screenwriters about the film industry, and so forth. Of course, Most Writers Are Writers does not entail that all writers are writers, only that a disproportionately large number of them are. According to the Bureau of Labor statistics, the number of writers and authors in 2012 was 129,100, or 0.04% of the US population. A different site estimates the low end at 250,000, or 0.08% of the population. In either case, clearly a much larger percent of books written include writers as main characters. The downside of Most Writers are Writers is that other people are underrepresented. To be sure, there are books and screenplays written about anything possibly imaginable. But the subfields are much smaller, and are often much less accurate because of this selection bias. For instance, scientific terms and concepts are used incorrectly all the time in the subfield of science fiction, where authors are supposed to have a higher-than-average understanding of science in the first place. We excuse sci-fi authors for making technical mistakes because they’re writers, not scientists (exceptions exist). On the other hand, when’s the last time you recall a blatant mistake written about the writing process or a book deal? Never, because someone writing about these will be knowledgeable of them. 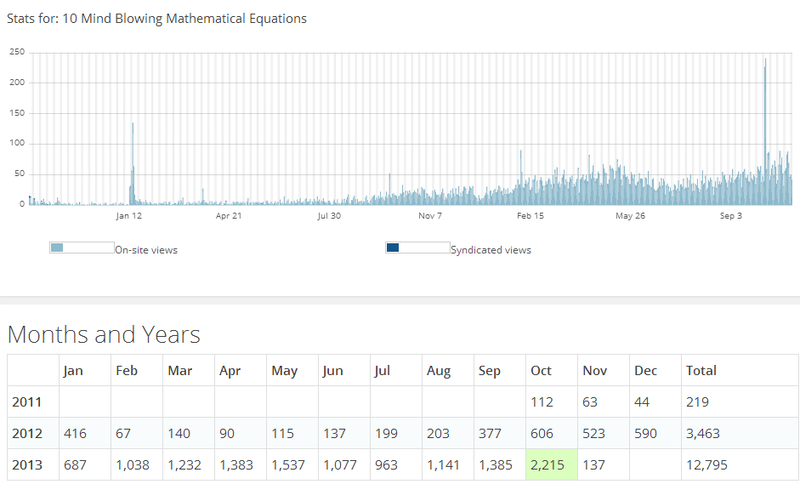 Last week I wrote a pretty direct post on religion, and it quickly became the third most-read post on my blog in the past year, first being this one math post that somehow has really good Google pagerank. Also, tomorrow, November 4, is the day this blog turns 4 years old, so I’ll go through some of the most-viewed posts of the past year. Apart from 1 and 4, all of the top viewed articles were on some controversial topic. This isn’t a good representation of a normal post—I write plenty of non-controversial posts. On average, however, the controversial ones get far more views, which makes sense as people are more likely to click a link to a stance with which they strongly agree or disagree. As discussed before, the taboo on religion basically acts as a shield preventing it from criticism, and even protects its more intolerant beliefs from criticism. There is an undeserved respect of religion in our culture. In daily life it is considered perfectly okay to argue about our favorite sports teams, our differences of taste in food and music, and even our political beliefs. But the moment religion is brought up, it suddenly becomes “rude” or “offensive” to disagree with a believer or to even slightly question his or her beliefs. This, of course, is prime hypocrisy as many religions downright treat agnostics and atheists as subhuman or fools: “The fool hath said in his heart, ‘There is no God.’” (Psalm 14:1). Imagine the public outcry that would occur if, in some atheist meeting, the members called all religious believers “fools.” Yet when religious people call all atheists “fools,” it’s perfectly okay, because you got to respect their religious beliefs. I suppose when religious people call blacks or women inferior, you’re supposed to respect that too? Does the religiosity of a belief make it immune to criticism? The defensive nature of the taboo may not be coincidental, according to Daniel Dennett in Breaking the Spell, but I’ll talk about that later. Anyways, the point is that the discussion of religion should not be discouraged. Moreover, the discussion of taboo becomes a sort of meta-controversy. Based on the stats, namely that the controversial stuff is significantly more popular, I’m going to write them as a higher percentage of posts. Here’s to a good 5th year!